I am a PhD student in the Department of Electrical and Computer Engineering and a member of the Image Analysis and Communications Lab. 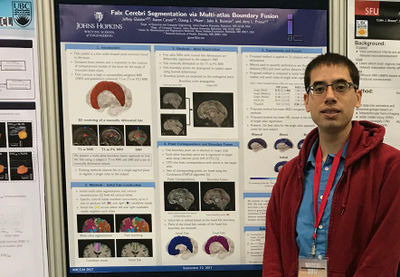 My area of research is the processing of diffusion MRI to automatically segment the thalamus and thalamic nuclei, developing methods to reconstruct the layers of the meninges (subarachnoid space and dura mater), and to find the falx cerebri and tentorium cerebellum to improve computational models of traumatic brain injuries. Me presenting a poster at ISBI2015 in New York City, USA. Me presenting a poster at SPIE Medical Imaging 2016 in San Diego, USA. Me presenting a poster at MICCAI2017 in Quebec City, Canada. R. Amelard, J. Glaister, A. Wong, and D. A. Clausi. "Melanoma decision support using lighting-corrected intuitive feature models," in Computer Vision Techniques for the Diagnosis of Skin Cancer, J. Scharcanski and M. E. Celebi, Eds. Springer-Berlin Heidelberg, 2013, pp. 193-219. J. Glaister, A. Carass, T. NessAiver, J. V. Stough, S. Saidha, P. A. Calabresi, and J. L. Prince. 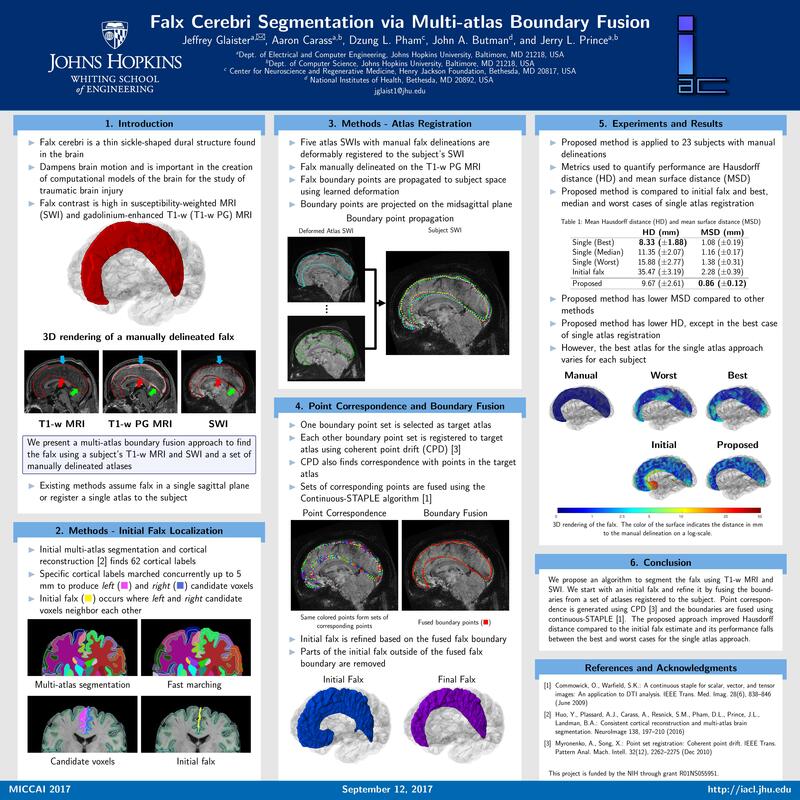 "Thalamus segmentation using multi-modal feature classification: Validation and pilot study of an age-matched cohort." NeuroImage, vol. 158, pp. 430 - 440 , Sept. 2017. R. Amelard, J. Glaister, A. Wong, and D. A. Clausi. "High-Level Intuitive Features (HLIFs) for Intuitive Skin Lesion Description." IEEE Transactions on Biomedical Engineering, vol. 62, no. 3, pp. 820 - 831 , Mar. 2015. J. Glaister, A. Wong, and D. A. Clausi. "Segmentation of skin lesions from digital images using joint statistical texture distinctiveness." IEEE Transactions on Biomedical Engineering, vol. 61, no. 4, pp. 1220 - 1230, Apr. 2014. J. Glaister, A. Wong, and D. A. Clausi. "Despeckling of Synthetic Aperture Radar Images Using Monte Carlo Texture Likelihood Sampling." IEEE Transactions on Geoscience and Remote Sensing, vol. 52, no. 2, Feb. 2014. D. Lui, A. Modhafar, J. Glaister, A. Wong, and M. Haider. "Monte Carlo Bias Field Correction in Endorectal Diffusion Imaging." IEEE Transactions on Biomedical Engineering, vol. 61, no. 2, pp. , Feb. 2014. A. Wong, J. Glaister, A. Cameron, and M. Haider. "Correlated diffusion imaging." BMC medical imaging, vol. 13, no. 1, Aug. 2013. A. Cameron, D. Lui, A. Boroomand, J. Glaister, A. Wong, and B. Kostadinka. "Stochastic speckle noise compensation in optical coherence tomography using non-stationary spline-based speckle noise modelling." Biomedical Optics Express, vol. 4, no. 9, pp. 1769, Aug. 2013. J. Glaister, R. Amelard, A. Wong, and D. A. Clausi. "MSIM: Multi-Stage Illumination Modeling of Dermatological Photographs for Illumination-Corrected Skin Lesion Analysis." IEEE Transactions on Biomedical Engineering, vol. 60, no. 7, pp. 1873 - 1883, July 2013. 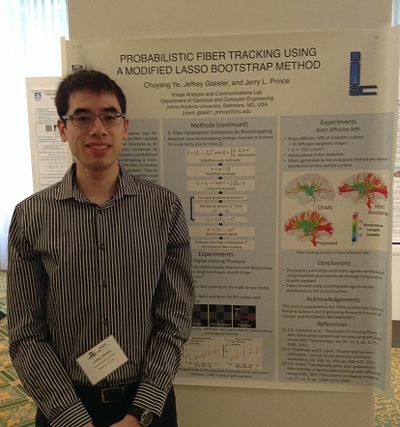 C. Ye, J. Glaister, and J. L. Prince, "Probabilistic Fiber Tracking using a Modified LASSO Bootstrap Method," in Proceedings of the 2015 IEEE International Symposium on Biomedical Imaging, pp. 943-946. J. V. Stough, J. Glaister, C. Ye, S. H. Ying, J. L. Prince, and A. Carass. 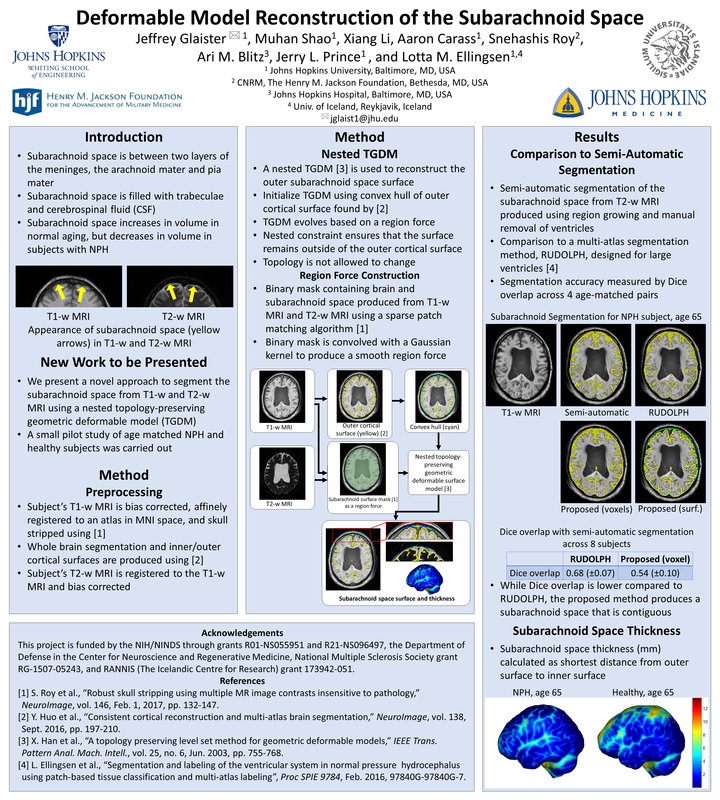 "Automatic Method for Thalamus Parcellation Using Multi-modal Feature Classification," in Proceedings of Medical Image Computing and Computer-Assisted Intervention – MICCAI 2014, pp. 169-176, 2014. J. Glaister, A. Wong, and D. A. Clausi. "Illumination correction in dermatological photographs using multi-stage illumination modeling for skin lesion analysis," in Proceedings of 2012 Annual International Conference of the IEEE Engineering in Medicine and Biology Society (EMBC), pp. 102-105, 2012. J. Glaister, A. Cameron, A. Wong, and M. A. Haider. "Quantitative investigative analysis of tumour separability in the prostate gland using ultra-high b-value computed diffusion imaging," in Proceedings of 2012 Annual International Conference of the IEEE Engineering in Medicine and Biology Society (EMBC), pp. 420-423, 2012. A. Cameron, J. Glaister, A. Wong, M. A. Haider. "Non-parametric Bayesian estimation of apparent diffusion coefficient from diffusion-weighted magnetic resonance imaging data," in Proceedings of 2012 Annual International Conference of the IEEE Engineering in Medicine and Biology Society (EMBC), pp. 412-415, 2012. J. Glaister, C. Chan, M. Frankovich, A. Tang and A. Wong. "Hybrid Video Compression Using Selective Keyframe Identification and Patch-Based Super-Resolution," in Proceedings of 2011 IEEE International Symposium on Multimedia (ISM), pp. 105-110, 2011. J. Glaister, "Automatic segmentation of skin lesions from dermatological photographs." MASc Thesis, University of Waterloo, ON, Canada, 2013. This page was last modified on 27 March 2018, at 14:30.